How I got Banned from Photographing Arch Enemy | Metal Blast! UPDATE: An update, addressing some issues raised by Arch Enemy, has been posted here. Back in June I covered Fortarock, a fantastic metal festival in Nijmegen, the Netherlands. I had the opportunity to shoot bands like Dragonforce, Watain, Týr, Alestorm and Arch Enemy, all of whom are not only really fun to photograph, but also extremely talented musicians. This being the Netherlands, shooting the festival also meant dealing with quite a bit of rain, particularly during the first day. Arch Enemy were particularly unlucky in this regard, since their set coincided with a massive downpour. This meant that I had to juggle my equipment while hiding under a poncho, trying to make sure it didn’t get too wet to function. Still, the effort was worth it, and the result of that first day was an image of Alissa White-Gluz, the singer of Arch Enemy, that, as soon as I published it on my Instagram, was very well-received by everyone, even by Alissa herself, who re-posted it on her account. Just as I saw that fans were re-posting the photo (something that I tend to turn a blind-eye to, as long as they don’t edit the images), I noticed that a company named Thunderball Clothing had posted it to promote their products. Since the post had been made on the account of the company, it was obvious that its purpose was to advertise. It was placed on an Instagram page that had a link to their online store, and my image was used to show the products that they had created for Alissa. In other words, this wasn’t merely a fan using the photo because they liked Arch Enemy (which I would normally tolerate), but instead a business, profiting from my work without even asking for my permission. I send take-down notices like these all the time, since this is hardly a rare occurrence on Instagram, and this one seemed to me like a no-brainer. I even thought that they’d be happy with it, since I would even allow them to continue using the image in exchange for a small donation to a cancer charity. This is a method that I’ve even used with clients, benefitting organizations like the ACLU, so I sincerely thought that that things would go smoothly. The message was putting forward the idea (a common one among some people) that because members of the band were in my photos, it meant that the band (and their sponsors) were authorized to use it however they wanted. This made no sense since, although there are some restrictions (for example, I can’t use a photo of Alissa to promote a product, unless she expressly authorizes me to do so) I am the only one who gets to decide how and where my work is used. To put it in legal terms: I own the copyright over my photos. The message also sought to perpetuate the ridiculous system that some bands expect to have with photographers: They let them come into the pit, expect to have the absolute and perpetual right to use the photos in whatever way they want, and pay photographers in “exposure,” by using their work before a massive audience. In the past, artists like Taylor Swift, Lady Gaga, and even The Foo Fighters, have gone beyond merely assuming that they have this right, choosing instead to force concert photographers to sign contracts where they have to, quite literally, surrender all of their rights over the photos. Aware of the fact that most photographers are not exactly versed on legal terminology, that photo pits aren’t great places to read contracts, and that many photographers simply can’t afford not to shoot a big band, artists have been able to profit from the many photographers that, for whatever reason, end up signing their rights away. I just realized that the message was not sent by Marta, but by Arch Enemy directly. Could you tell me who I’m speaking with here? As for Arch Enemy, I did not object to Alissa‘s use of my photo (I even spoke about the use with her after she posted it) although, of course, this would be my right. The problem is that now my work is being used to promote a product. Although this wasn’t the first time a company used my work illegally, it was definitely the first time a band came out to defend the infringer. Most people realize that they screwed up and simply apologize. This is especially true when you’re dealing with artists, who obviously are much more sensitive to the problem of not being compensated for their work. It was because of this that it felt so humiliating to have to explain to another artist why my art, and my work deserved the same level of protection and respect as their art. A photo of Angela Gossow that I took back in 2012, well before I knew how to properly use a camera. Note the “Anarchy – Equality” patch on her jacket. As I explained directly to Alissa on Instagram, she was free to use my photo on her Instagram, and welcomed her to do as much. I routinely allow fans of the band to use the photos I take of her, and even [others] musicians [that I have photographed]. As an artist yourself, however, I’m sure you believe that you should be compensated for your work when it is being used to promote products. I think it’s regrettable to see that your reaction to an artist reasonably requesting compensation for the use of the work is so dismissive and disrespectful. I fail to understand the rationale behind it, since I have maintained a respectful tone throughout my communications with you. As for the price tag, I routinely work for much higher amounts. In this case, however, I requested a donation of €100 to the Dutch cancer foundation by the company that was exploiting my work. I would receive absolutely no part of this money. I sincerely regret the reaction of banning me from the band’s performances as a photographer, but that’s certainly your prerogative. For reasons I absolutely failed to understand, I had been accused of “threatening” someone for merely explaining that licenses need to be paid, mocked for the value of my work, and had my words and actions blatantly misrepresented. To make matters worse, Angela Gossow was very openly stating that she expected all photographers that cover Arch Enemy‘s shows to do so for free, to the benefit of the band. After all, as she herself had said, “no band wants to have photographers on site who later send such threatening correspondence to monetise on their images.” Considering that, in her view, “threatening” meant asking for payment, it was obvious that she expected most photographers to work “for the love of the art”. I have never tried to sell Alissa White-Gluz or Arch Enemy anything. In fact, I had briefly spoken with Alissa on Instagram telling her that I was happy she liked my work after she reposted it. The only party that I contacted about a licensing issue was Thunderball Clothing. I never contacted Arch Enemy or made any “demands” from the band or their label. I never sent any “threatening correspondence” (as the messages clearly show). It’s not only that asserting my rights as an artist is not a “threat,” but also that none of my messages had even included any mention of legal actions or repercussions. I never “demanded” a payment of €500. Instead, I explained that this was an amount that I could charge for the use of my material in a commercial setting, but that I was happy to let it go for €100 to be given directly to a charity benefiting cancer patients and cancer research, the KWF Kankerbestrijding. Some might argue that even bringing up the €500 is obscene, but try going to a store, walking out with something without paying, and see if you can haggle over the price after security stops you on your way out. Later in the evening, considering that I had already been in touch with her directly, I reached out to Alissa in the hopes of clarifying what clearly seemed to be a misunderstanding. It didn’t go well. Sadly, Alissa was quick to portray me as some sort of bottom-feeding scum trying to score an easy buck. I was even accused of, potentially, being the kind of person who would “pursue” fans for sharing the image, even though right now there are dozens of fans that have exactly that same image on their fanpages, and against whom I have taken no action (other than occasionally asking them not to crop or edit them, and to make sure they tag me), despite being fully entitled to do so. Arch Enemy‘s stance in regards to photographers, as demonstrated by the band’s very aggressive approach against me for simply seeking some form of compensation from one of their sponsors, shows their absolute disregard for artists whose art isn’t their art. They (as they should) expect compensation for their work, but they don’t seem to think that others should be compensated as well. As a matter of fact, and as Angela Gossow‘s actions clearly show, they will try to stomp and trample on anyone who seeks such compensation. Nothing else can explain why she went out of her way to contact bookers and promoters, hoping to end my photographic career. What I find most terrifying about Arch Enemy‘s behavior is that it creates a chilling effect among photographers, all of whom are now expected to simply shut up and take the abuse, unless they are willing to risk their artistic careers. While I have the good fortune of not depending on photography for my income, many other photographers aren’t so lucky, and so they cannot afford to run the risk of being blacklisted, knowing full well that it could, quite literally, make it impossible for them to make a living. As evidence of this, in the writing of this story I approached a number of high-profile music photographers who, once they realized the band that was involved, did not want to be anywhere near it. They agreed that the system was terrible, and that what Arch Enemy and their sponsor did was wrong, but they did not want to risk ending on the band’s bad-side. Another problem with Arch Enemy‘s approach to copyright (in this case to protect one of their sponsors) is that they don’t use the same standards when it comes to their own content. 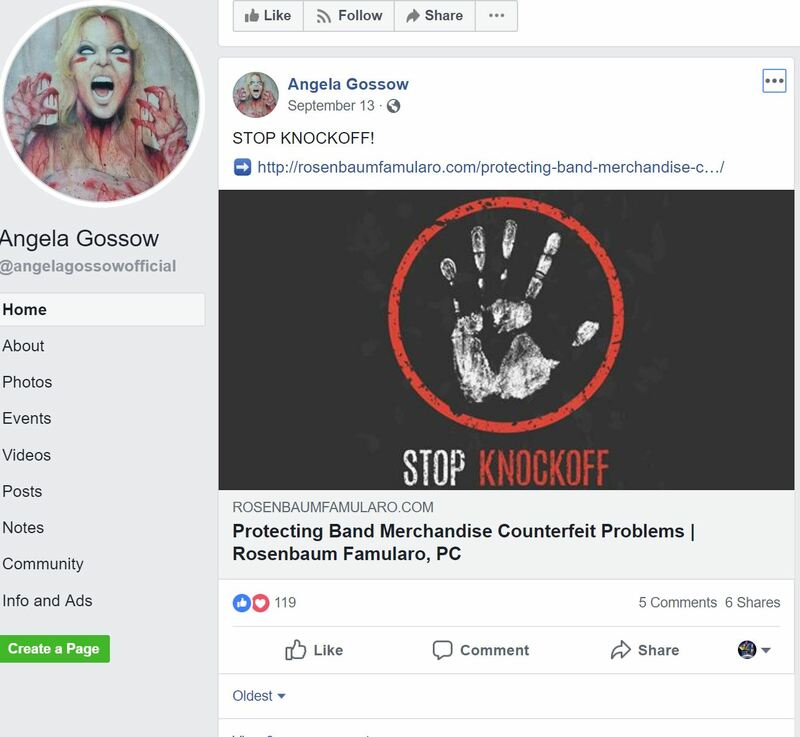 After all, Alissa herself had told me that they regularly take down sites that illegally profit from their intellectual property, and Angela herself recently shared a link highlighting the problem with counterfeiting. Of course, it goes well beyond the mere selling of counterfeit material, as I discovered with a very simple experiment: I uploaded the full version of their song “The World is Yours” to Youtube, where it was immediately flagged as infringing on their copyright, and filled with ads that would go to benefit them instead of me (don’t worry Angela, I deleted the video already). Incredibly enough, Arch Enemy are not satisfied with the exposure that this video would give them. It is certainly ironic to see that this situation was created by a band of alleged anarchists that proudly parrot anarchist and far left slogans like “No Gods, No Masters” and “Under Black Flags we March,” while exhibiting the same kind of bully behavior that you’d expect from their corporate nemeses. They exhibit a worrying willingness to perpetuate the power structures that trample over the weak to benefit the powerful. It is certainly disappointing to see that it is a band that sells an anarchist image that has taken this approach. Maybe now that they have attained the fame and money that they so eagerly criticize in others, they fear that there isn’t enough to go around. If you are interested in donating to the Dutch Cancer Fund, please click this link! Author’s Note: This article was supposed to be published back in July but, due to a number of health and professional reasons, its publication, together with the accompanying video, had to be postponed. Since we consider the topic to be equally relevant today, we are publishing it in full. We apologize for the delay.